To get started, log into your Voiply port by going to https://my.voiply.com. After that follow the steps below to start getting your calls recorded. 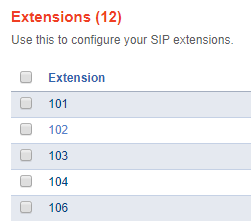 From here you will select the extension you wish to enable call recording on by clicking on the extension. Once you select the record option you wish to use. Click Save in the bottom right of the page. After the option has been set, You can find all recorded calls under Reports > Call Detail Records. Once you are in the Call Detail Records, Any calls that have been recorded will show a Play and Download button on the same line. Simply click on the Play or Download button to either Play the recording right over your computer or you can download it for future records. Please note recordings are kept in Call Detail Records for 90 days. If you wish to have them longer, please use the download function from the portal and save them locally.